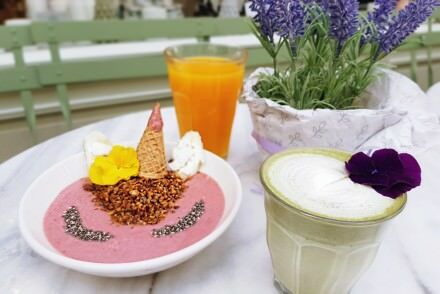 Mira: A few years ago, while I was travelling in Tuscany, my friend had organised a vegetarian cooking class with two lovely Italian women in their home – and this turned out to be the best part of the trip. It was there that I roasted peppers for the first time, spreading some goat’s cheese on crostini and then layering thin slices of red and yellow peppers with fresh herbs. I’ve never loved peppers – well they’ve always been one of those nondescript vegetables for me – but roasting them altered the flavour entirely… So deliciously sweet and tasty! And I just couldn’t get enough. 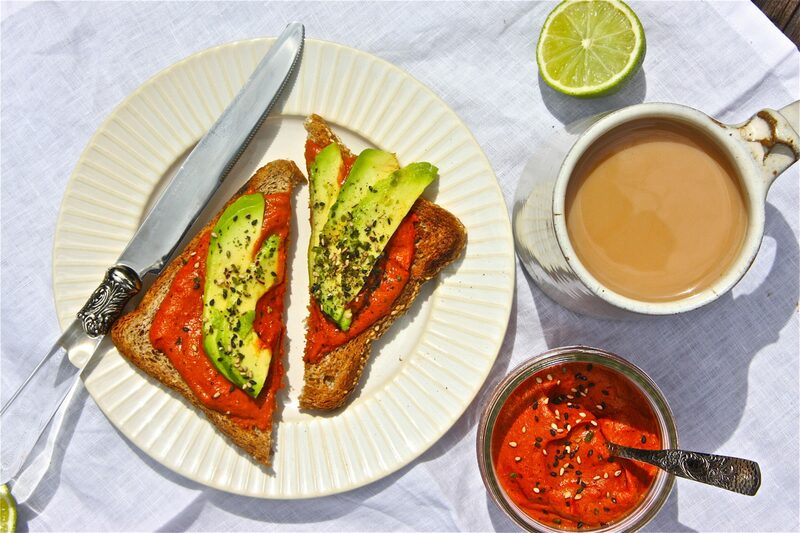 Anyway avocado on toast with chilli flakes, makes a deliciously healthy breakfast and it’s livened up perfectly by the roasted red pepper spread with chilli flakes and paprika. 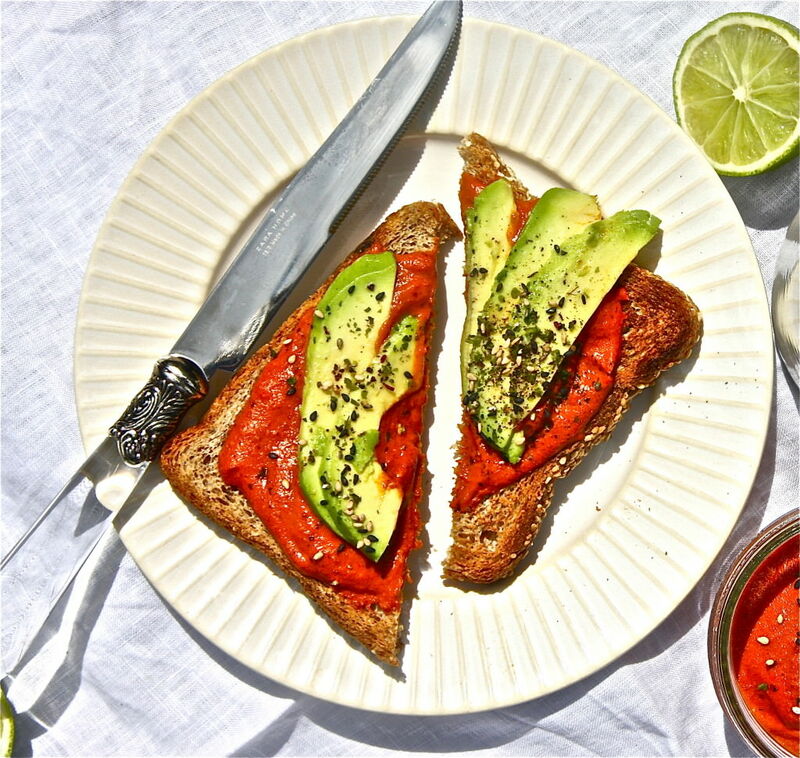 It gives the avocado on toast a layer of spicy yumminess, not to mention the bright splash of colour. And you only need to spread a very thin layer of the sauce. I’ve used spelt bread here, but you can use any bread, and I’ve also used my favourite furikake mix – with toasted mixed sesame seeds and herbs, but you can just add plain sesame seeds. Start by preheating the oven on Gas Mark 4. Cut the red peppers, discard the seeds and roughly coat them with some coconut or any oil. Roast the cherry tomatoes, tomato and red peppers in the oven for 30-45 minutes (at least 30 minutes). 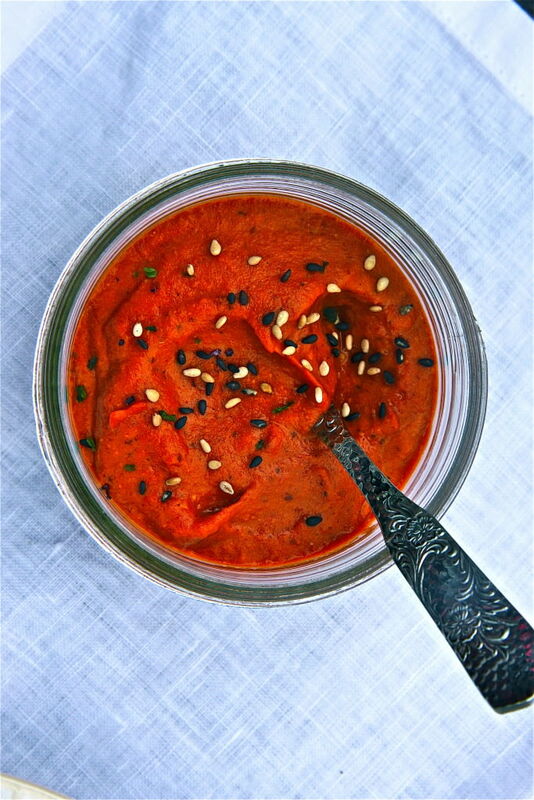 Now you can place the red peppers, tomatoes and the rest of the ingredients in a blender and blend until a smooth paste is formed. Taste and add salt or more chilli if needed. Spread on toast and add a few slices of avocado. 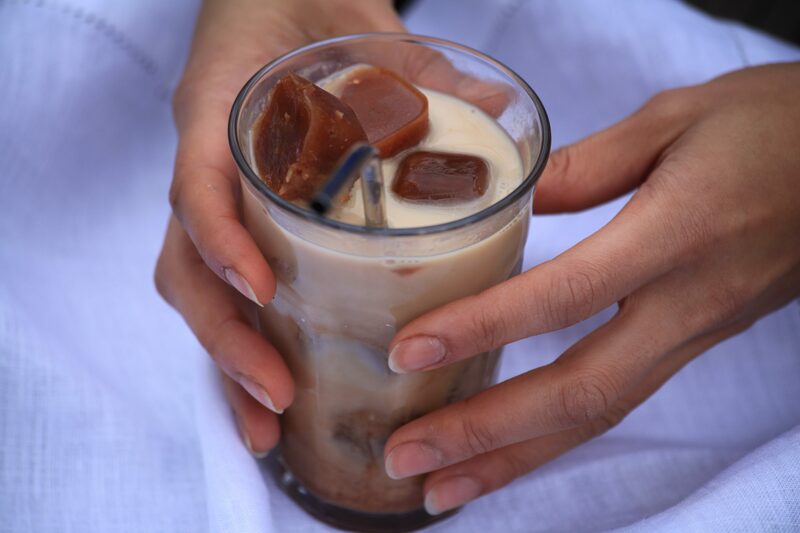 Mira: Summer or winter, I always love a cup of strong chai, but sometimes, when it’s actually hot outside and you want something cooling yet rich and decadent, why not make a cup of chilled chai. Keeping ice cubes ready in the freezer means you can serve up this summer delight to anyone without any preparation or make it for yourself without all the effort grating the ginger and boiling the tea each time. Just pour almond milk over the ice cubes and keep a few stylish glasses ready. 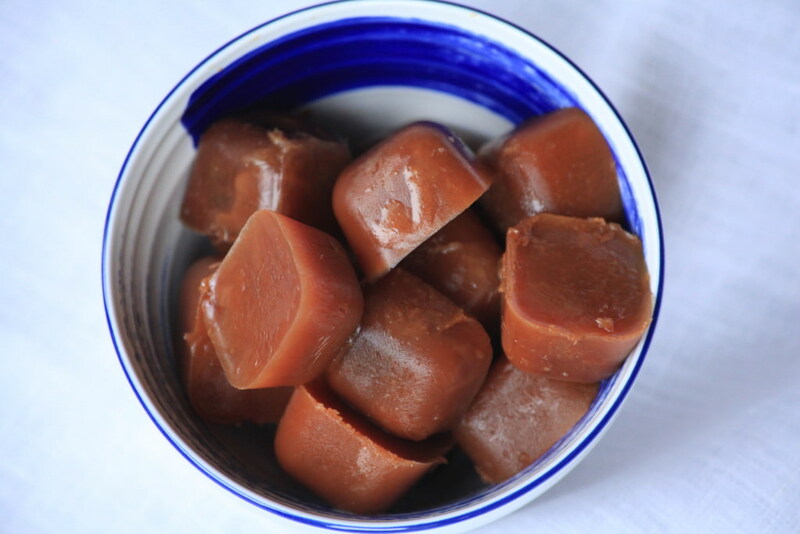 The cubes will work their magic within minutes, as they start melting and the milk becomes infused with the powerful tea, a kick of ginger, hints of masalas and a warming sweetness. 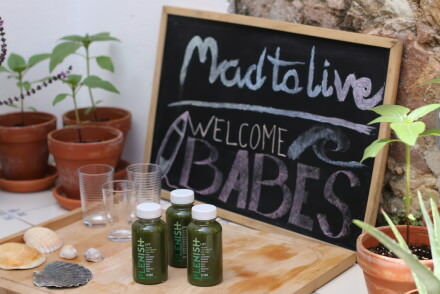 Delightfully healthy yet gloriously rich. And the more the ice cubes the better! 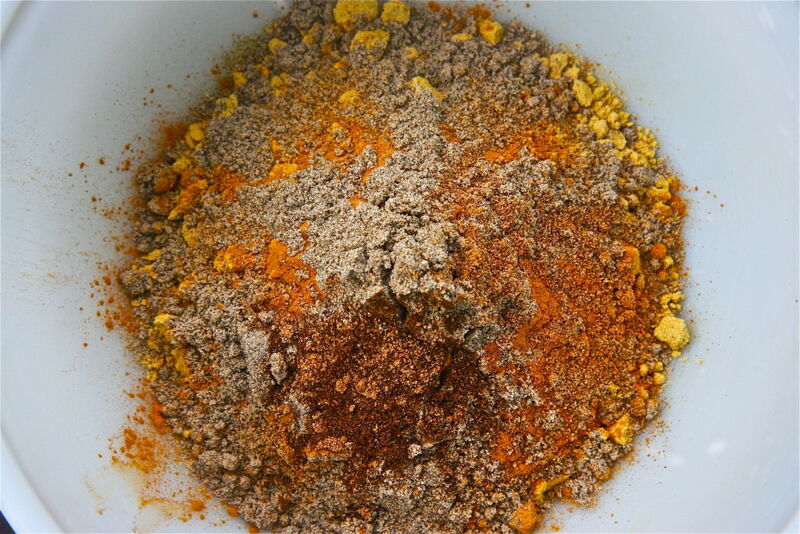 Boil together all the ingredients and then strain into the ice cube tray. Leave in the freezer. When frozen, place a few ice cubes inside a glass (four or more) and pour the almond milk over the cubes (or any milk of your choice).